I’ve been blogging for close to a decade now (pls don’t do the math haha). Yup, if your patient enough, you’ll find a ton of blackmail photos hidden in there somewhere. But the upside of me documenting everything is being able to look back and see just how much my style has evolved. 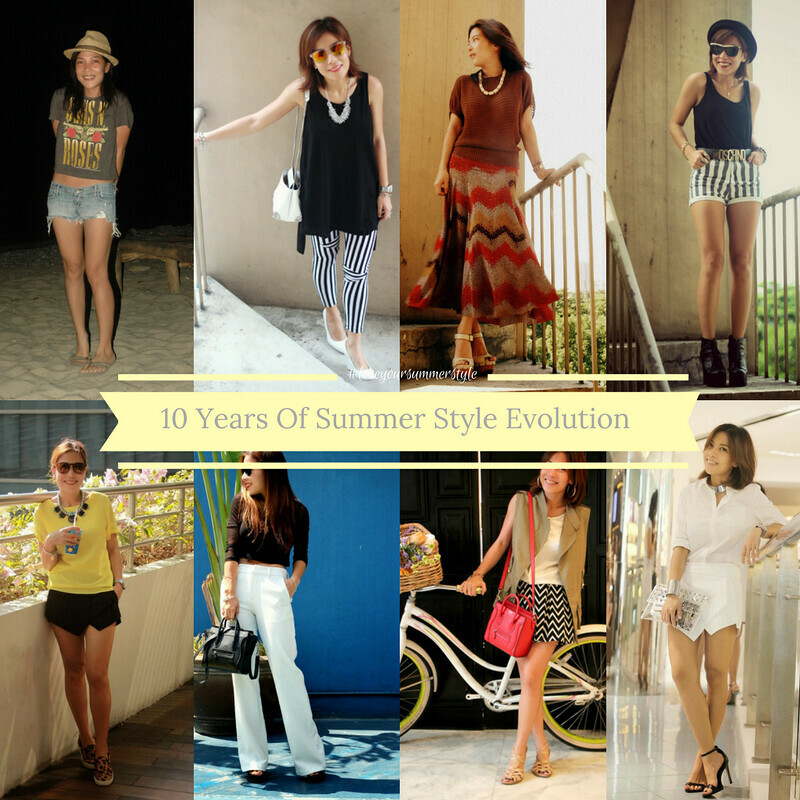 I never realized how much fun it would be to compile a decade’s worth of summer ootd’s until I actually did it! Read on to see how I’ve transitioned from 2007’s extreme boho with low-rise denim and lace to 2017’s more refined interpretation + everything in between. Join me as I take you back to my pre and present Fashion Eggplant years! And lastly, how much I rely on The SM Store to fill my closet with all the latest trends, season after season, year after year. Their inventory just keeps on improving! Back in 2007 when I was younger and my budget for clothes was smaller, my first stop for summer shopping would be the SM Store. Wether I was looking for a cool pair of shorts with unique details, cute babydoll tops, or vintage looking lace dresses, they always seemed to have what I needed and it always cost less than P1000. See lace top above? If I remember right, I got it for around P400 only. + walk to the left for accessories, walk to the right for shoes. It's always a fun one stop shop hassle free experience for me during each visit. I can spend an entire day in there just putting together whole outfits. Those mini shopping carts are a saving grace! I just really really enjoy shopping there, it's like a grocery store for all things fashion! So much so that to this day, even if my current fashion budget allows me to splurge a little more, I still choose to shop at The SM Store. I can't resist a quick stop each time I'm in the area. After a quick web search on trends, I pop in and grab a key piece. Do you have a favorite look from the past that you love just as much today? Mind you, most of these are still in my closet. Have not - cannot let them go. A few weeks ago, I decided it was time for another visit. I made a quick list of what I needed to update my wardrobe for the season after a pinterest check on the hottest looks this year. C H E C K C H E C K C H E C K and mooooore C H E C K S! The SM Store has got each unique style identity covered so you can dress to express the real you. Has The SM Store played a part in your Style Evolution as well? I'd love to see! I swear you'll love what they have right now and you'll never be want for choice. I promise you’ll find pieces that’ll speak to you and make you #Loveyoursummerstyle even more!